Mickey Mouse is one of the most iconic cartoon characters of all time. The New Zealand Mint decided to honor some popular Mickey Mouse films with the Mickey Through the Ages Coin Series, which includes a number of silver and gold coins. In the latest release, you can see imagery of Mickey from the short film Plane Crazy. 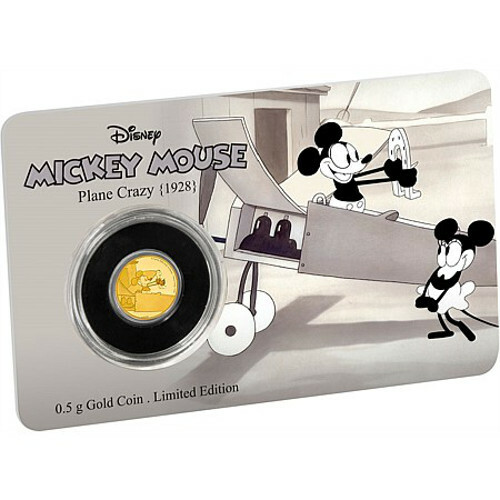 Now, you can get the 2016 1/2 Gram Gold Niue Mickey Mouse Plane Crazy Series Proof Coins at Silver.com. Third release from the Mickey Through the Ages series of Disney coins. Reverse features the image of Mickey Mouse in Plane Crazy. New Zealand Mint released the Mickey Through the Ages Series in 2016 to honor the brilliant cartoons created by Walt Disney that feature everyone’s favorite mouse. As the third releases in the series, the Plane Crazy coins showcase artwork from one of Mickey’s earliest films. Other releases in the series include imagery from the animated film The Band Leader and The Brave Little Tailor. 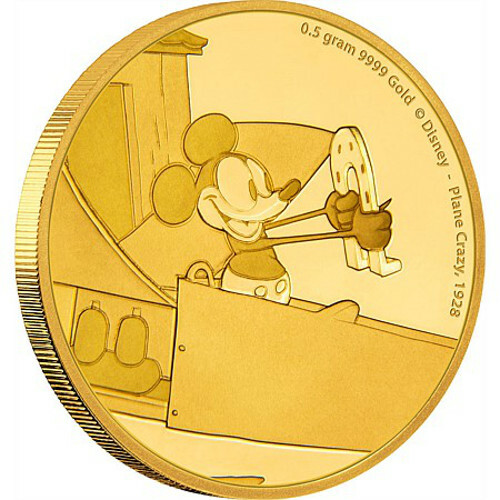 In the latest design from the series, Mickey Mouse can be seen on the reverse of each 2016 1/2 Gram Gold Niue Mickey Mouse Plane Crazy Series Proof Coin standing in the cockpit of the ramshackle plane he is building. The plane is made out of spare car and farm equipment parts. With the help of a few of Mickey’s farm buddies, they finish the plane. In the image, you can see Mickey holding the lucky horseshoe that Minnie Mouse gifted him for luck. On the obverse of each coin, Queen Elizabeth II’s image is seen in right-profile. The image was created in 1998 by Ian Rank-Broadley. 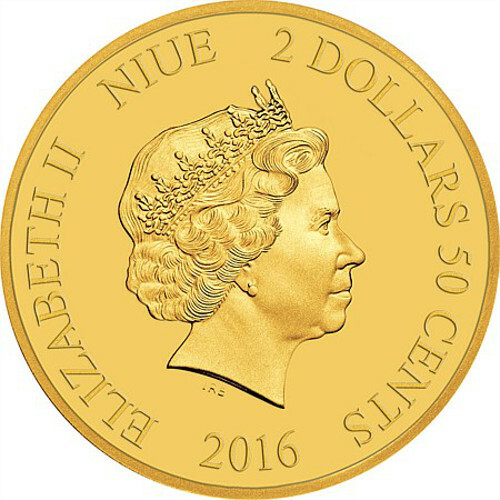 It is the fourth depiction of the Queen seen on New Zealand coinage since she was crowned. Every coin in this listing arrives in a plastic card featuring artwork from the animated film. On one side of the card, you can see the Certificate of Authenticity for the coin.